We've been busy the past few days. Friday: I went plant-shopping with a friend while Frank went to a doctor appointment. Then I baked a chicken dinner and Allison arrived to share it with us. Saturday: In the morning we set up for the library program (signs, coffee, chairs, intro), took down everything afterwards, spent afternoon with Allison and at the same time supervised a crew who arrived to cut up the trees that blew down in the storm. Had dinner at the 263 Diner. Then Allison left. 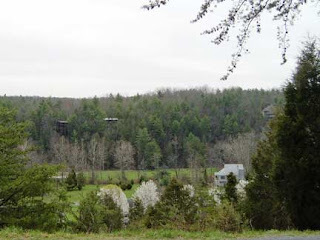 Sunday: Did laundry, supervised the yard crew who cut down brush and hauled it away, went to local art studio tour - three artists exhibited here in Bryce and two more out on Crooked Run Road. Today: Some paperwork and phone calls, then a trip to one of the plant nurseries that Carlas showed me just off Turleytown Road (west of Broadway). 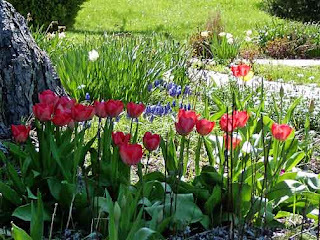 It's called Spring Gardens. 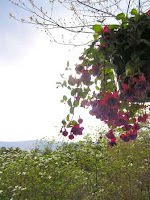 We bought four hanging baskets and a bunch of potted flowers for the yard. Also stopped at the recycling center and the Food Lion. This evening Frank started painting the entry room. Click the arrow for a 2-second video. 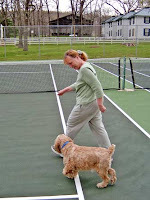 Here I am with Ben at the tennis court in Orkney Springs. We forgot to take his ball with us so we took turns getting him to run around with us. 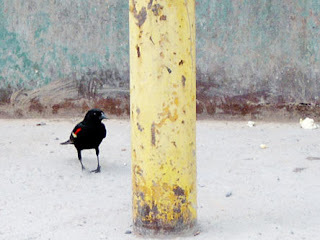 I believe this is a red winged blackbird. I don't see them around here very often but this one was hanging out by the public dumpsters on Orkney Grade. 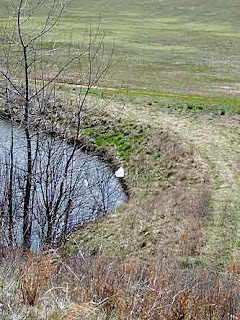 Frank signed up this lovely piece of farmland for sale. It's an eleven and a half-acre parcel east of Mt. Jackson on the lower slopes of Massanutten Mountain. 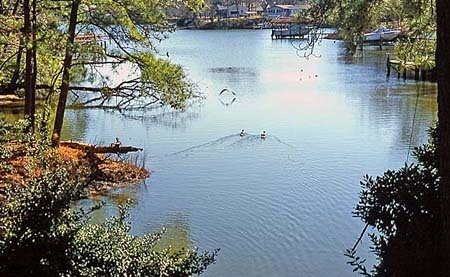 It's practically suburban - not far from town and close to a few other homes. It has a lovely view. 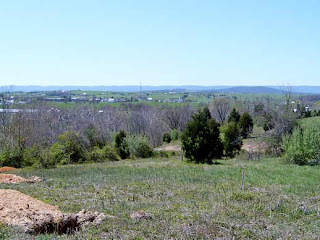 This is Fisher's Hill, the Shenandoah Valley's "Gibralter" -- a commanding height that offered Confederate forces a superb defensive position. Confederate Gen. Jubal A. Early's beaten and bloodied army filed into position here on September 20, 1864, one day after the disaster at the Third Battle of Winchester. For the next two days the men strengthened their position, but no amount of digging could make up for Early's lack of men. 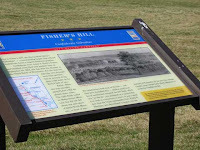 Early's defensive line extended along Fisher's Hill for almost three miles. The right flank rested on Massanutten Mountain, but the left fell about one mile short of Little North Mountain in front of you. His infantrymen held most of the line -- and they were stretched thin -- while a small number of cavalrymen occupied the left flank, which was "in the air" (not anchored on a natural feature such as a mountain or river). It was a weakness that the Union commander, Gen. Philip. H. Sheridan, was determined to exploit. On the morning of September 22, he sent Gen. George Crook's corps toward Little North Mountain to strike the Confederate left. Our tenant at Glebe Harbor says she wants to stay another year. Yay! That way our mortgage there is covered until next summer. I'll miss being able to spend weekends there but for the money we'll save we can go plenty of other places. 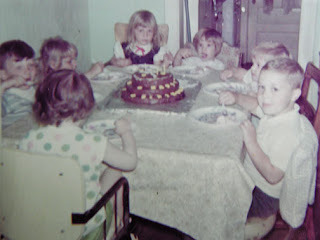 A long time ago and far away, Marie had some friends over for her 3rd birthday. Once in a great while I buy some goat butter. It does not give me tummy pain for several days the way cow butter does, and I like buttered vegetables now and then. This tiny pack of goat butter cost $3.99 - that's $15 a pound! That's one reason I don't buy it often. The other is that I can't buy it around here. I have to drive 2 hours to Whole Foods to find it, so naturally I only buy it when I happen to be in Northern Virginia for some other reason. Last weekend we drove up to Woodbridge to put a house up for rent and I insisted that we make a side-trip to the new Whole Foods at Fair Lakes. It's a nice store, very large, with a huge section devoted to salad bars and ready-to-eat foods. If you've never been in a Whole Foods at lunch time, you haven't seen the frenzy of hungry people buying containers of tasty foods to eat for lunch. Obviously not everyone wants a burger and fries! Anyway, I did not find the goat butter right away but a couple of friendly store employees helped me locate some - it had just come in and wasn't even on display. I purchased two of the precious little packets. I use just a tiny bit at a time so it will last me a while. 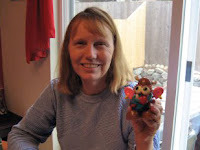 I recently read Leader of the Pack by Nancy Baer and Steve Dunno. 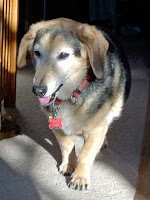 It's a short book on earning your dog's respect by behaving as a pack leader - consistently. It was recommended by a dog trainer. Control all space in the home. Be fair, calm, and confident. Be a good provider and protector. We do well on some of these but need to work on others. I found this book to be very instructive. 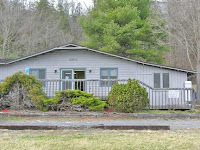 Frank owns a one-level house in the Forestdale section of Dale City which will soon be available for rent. Monthly rent will be $1495 and it has 3 BR, 1.5 baths, a family room, and a garage. 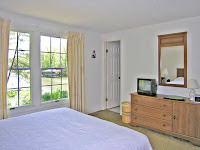 You can find the listing on Realtor.com. Also, I posted a brief summary on walcroft.com. The community where I grew up is now "historic." Tauxemont is dedicating its first historic marker on April 28. This seems a bit strange to me since Tauxemont was a new subdivision when my parents moved us there. It was a modest subdivision situated among the trees in the Fort Hunt area of Fairfax County, Virginia. Now it has passed the half-century mark. Our county library system has redesigned the Shenandoah Library System website. I use it fairly often to search the catalog or renew a book. Our little community library here in Basye has several computers for visitors to use and wireless internet access for those who bring their own laptops. Our library is a rarity: a fly-in lending library. It is adjacent to the airstrip. Airport info is on caros.net/basye. This house is around the corner from us. 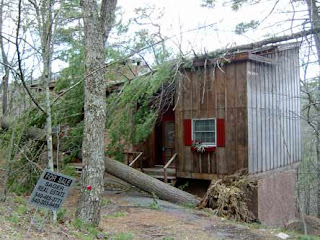 I took the photo yesterday morning and by late yesterday afternoon a crew had removed the tree from the house and was in the process of sawing away the large tree on the driveway. Yikes! My dog's favorite food has been recalled: Natural Balance Venison and Rice. Here's the story in USA Today. The food does not contain gluten and the company thinks that there may be melamine in the rice protein. They write: Dogs or cats who have consumed the suspect food and show signs of kidney failure (such as loss of appetite, lethargy and vomiting) should be seen by a veterinarian. Thankfully, my dogs don't have those symptoms. Here's the FDA page on pet food recalls. Our electricity was restored an hour ago after being off for 26 hours. We made good use of flashlights, candles, the fireplace, extra blankets, and even the outdoor grill, so I won't complain about the discomforts. Instead let me share a benefit: we found out where cold air is leaking into our house! So our energy-stealing culprits are a window in the master bedroom (which we already knew about), the sliding door in the dining room (a surprise), and the crank-out window in the kitchen (old crank-out windows are often leaky, so I shouldn't be surprised at that one). Also the fireplace lets out heat when the damper is open, of course. Closing that damper was a no-brainer when the wind started blowing down the chimney! Of course, that meant no fire to warm us up while the winds were high, so we piled on blankets. This morning the winds died down and we were able to enjoy a fire. And at lunchtime we cooked a meal on the barbecue grill. 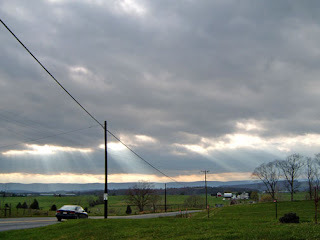 Early this winter we tried to get an energy audit but our power company here doesn't do them and we couldn't locate any who did them in Shenandoah County. Now nature has done one for us, showing us the leaks that steal our electricity dollars. 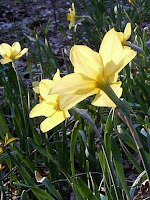 I took these pictures last spring and never got around to posting them. 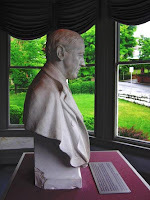 We visited the birthplace of President Woodrow Wilson in Staunton, Virginia. 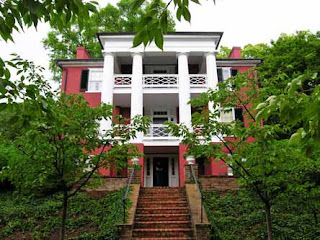 It is adjacent to a museum which tells the story of Wilson's life. Wilson did not live in Staunton very long. His father was a minister and was transferred to Georgia while little Woodrow was still a baby. 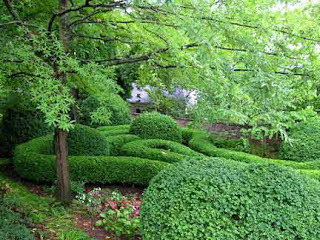 We enjoyed seeing the carefully sculpted shrubbery in the garden. The Northwest Trek, in photos taken by Ryley, in pictures taken with Josie while Ryley was in school, and playing with Play-Doh. The Boyles family will come to Virginia for a visit this summer. It will be good to see them again. If you travel to a lot of sites served by DoubleClick (or a similar company — I see cookies from specificclick.net and realcastmedia.com on my machine right now), your surfing habits can be tracked. In fact, they are. These companies want to serve you ads you might be interested in, and they want to build up a profile of who's going where. Is that spyware? In a sense, perhaps. But it's just a tracking number on your computer. It doesn't do anything; it's not "ware." The cookie you are seeing is from a trusted partner who we are working with to provide more intelligence to you about your visitors. In the past few days we’ve begun beta testing this cookie. 1 - If you replace your current Java code with the standard HTML Sitemeter code the cookie will no longer be issued. 2 - We can move you to a new server that will be restricted from the cookie process. Personally I don't see anything to panic over. However, Sitemeter owes it to their subscribers to address the concerns on the Sitemeter homepage. Privacy issues are a hot issue. 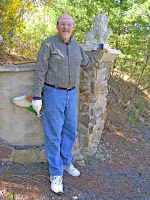 I added a SiteMeter to the Spiritual Singles website. This will enable the webmaster (me) and the organization's leaders to see how many visitors are looking at the site. 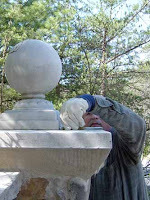 I updated my Civil War Field Trips site blog. I really should do that more often. Sometimes people write to me about Civil War sites and I don't post their emails, which could be of interest to other folks. I still get emails from people who see my Glebe Harbor pages. Usually they want to know if our house is still for sale. I tell them that at the moment it is still leased out to a tenant (through June). 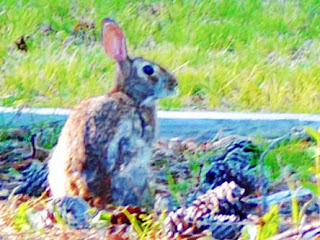 May 18: Deals with the Northern Invasion Corridor, Winchester VA area. May 19-20: Deals with West Virginia 1861, starting in Grafton on 5/19 after lunch. Overnight at Elkins. 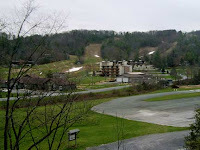 The West Virginia tour will be similar to the trip I took in 1999 which included Grafton, Phillippi, Corrick's Ford, Cheat Mountain, Greenbrier River, and Camp Allegheny. The class is for-credit but just about anyone can sign up (for the cost of tuition). The course description is at www.nvcc.edu/schedule/crs2073/course_detail_new.asp?indexno=19911. 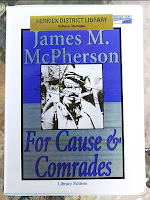 The instructor is Charles Poland Jr., author of a thorough book on the struggle for West Virginia called The Glories of War, and it is available through Amazon. Is it just me or does this cloud look like jaws? 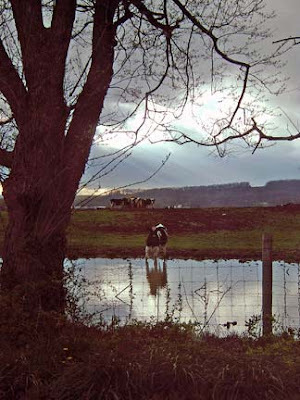 Many homes at Bryce have views - here are some examples. Personally I like our view as much as any of these. 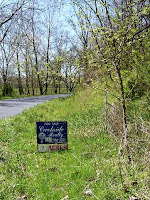 For those looking for a home here, try Creekside Realty, Basye, VA or write Frank at walcroft1@msn.com. I took this picture before I stopped filling the bird feeders on our deck. The squirrels were getting aggressive and I was afraid they would come through the screen door or even jump on us when we're cooking on the grill. I added a new bird feeder in the yard though. 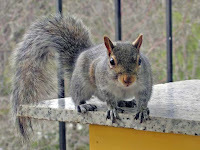 It is designed to thwart squirrels but they can still raid the other feeder down there. I like watching them but I don't want them to become pests. I listed For Cause and Comrades, Why Men Fought in the Civil War on ebay. This is the audio version on 8 cassettes. I'm asking a lot for it but it cost me more than that (used) and it's hard to find. I found this book in the "New book" section at the Basye library. It's a fascinating book and I finished it quickly. Author Henry Louis Gates, Jr. has used the family history of Oprah Winfrey as an example of genealogical research and a case study of how respect for education can lift a disadvantaged family out of hardship. The written record of Oprah's ancestors only goes back to the 1870's census because the last names of slaves were rarely recorded. Here the author delves into the history of slavery in America and (to a lesser extent) in Africa. He also discusses the after-effects of slavery following the Civil War. DNA now enables genealogists to bypass gaps in written history and learn where some of a person's ancestors came from. We learn that Oprah's matrilineal line likely goes back to the Kpelle tribe in Liberia. You don't need to be a fan of Oprah to enjoy this book. It's a fascinating look at genealogy and African-American history. 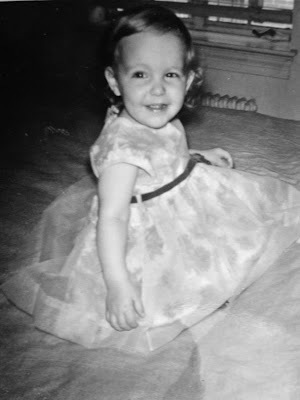 Lynn in her Easter dress, 1966. This was just a few weeks before her sister was born. 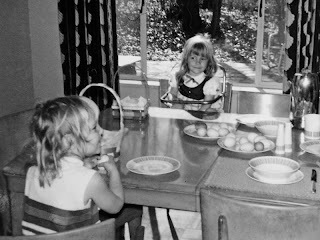 Their grandparents have prepared Easter eggs for Lynn and Marie, 1969. 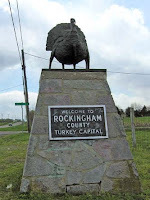 On U.S. 11 between New Market and Tenth Legion stands this turkey monument, welcoming you to Rockingham County. 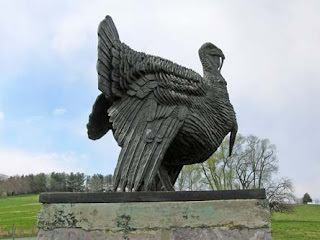 When we visited a museum in Dayton last year, we learned that the turkey was selected for the county's welcome signs several decades ago via a contest. The turkey was the suggestion of an African-American student - I believe he was around 12 years old. Rockingham County is one of the nation's top turkey producing counties. I noticed that this monument is not exactly at the county line. 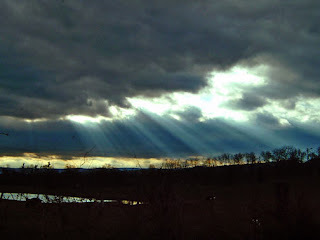 For those who feel compelled to visit it, it is at the intersection of the Valley Pike (Route 11) and Newdale School Road. 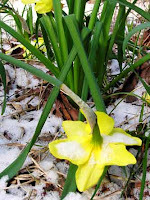 We had light snow last night. 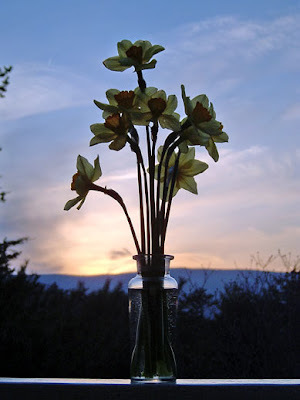 The daffodils hung their heads in sorrow this morning but after a day of sunshine, they looked perky this evening. 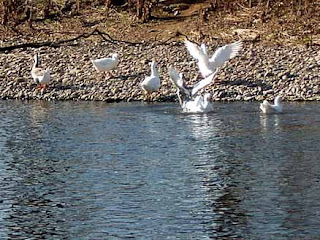 Although our regular trash is picked up in front of our driveway and we can take our recycling to Orkney Springs or Mt. Clifton, we have to haul large items to the county landfill for disposal. It's between Edinburg and Woodstock and the surrounding landscape is lovely. 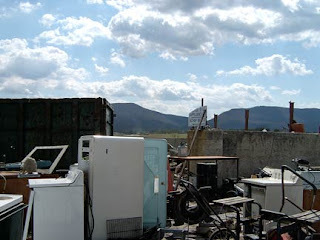 There was a rusty old stove in our garage so we took it here so it could be with other old appliances. 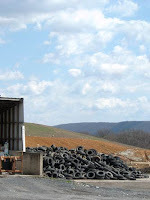 Link to Shenandoah County's Recycling Program. 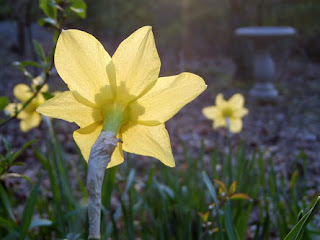 The daffodils face toward the sun, but I like photographing flowers with the sun shining through to show their veins, so here they are from the back. I hope they don't mind the freezing cold weather that blew in last night. It was 28 F when I walked the dogs this morning. PhotoWorks offers books that you create online, adding your own photos and text. I haven't tried it yet, but they sent out this idea for National Poetry Month: Create your own photo poetry book. When you are creating stunning Personalized Cover photo book, include text only layouts. Sounds like a great idea for someone who wants to make up a gift book. 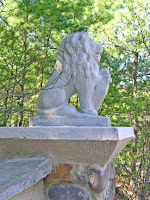 This is one of the lions that Frank decided to replace. 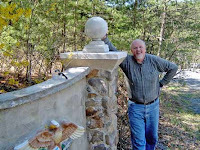 It turned out that it was not only cemented on but it also had a piece of rebar holding it to the gatepost, so he was not able to remove it without breaking it. Oh well... we have another pair of lions and they are better-looking anyway. 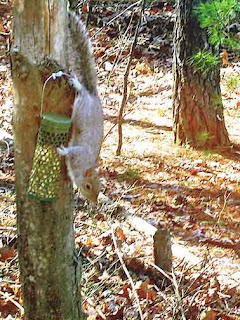 I bought this peanut feeder but it only lasted a few weeks. One day someone (possibly this squirrel) got it loose and absconded with everything but the top. I thought it would be nearby but I couldn't find it. This landscape is spoiled by plastic bags hanging in the trees. No doubt if you take a lot of photos outdoors you have noticed scenes ruined by plastic litter like this. 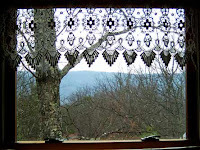 Shenandoah! A beautiful valley and a winding river -- how fortunate we are to live here! And since I love photography, I'm taking plenty of pictures and sharing them here. You'll find other subjects too. 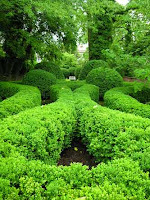 If you like historic sites or gardens or animals, you'll find them on this blog. Please visit often and feel free to comment. 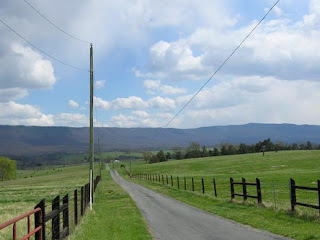 Enjoy some photos of the mountain-valley region of Virginia, along with a bit of history and other interesting subjects. 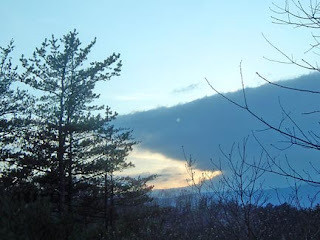 I try to update this blog daily, averaging over a photo a day. Since my work is covered by copyright laws, please contact me before republishing any of it. Click to Rescue Ocean Wildlife! Navigating this Blog: You can search the over 6,600 entries in this blog using the Search box at the top left of the page. To view other recent posts, use the Older Posts link (above right) or scroll up to the Blog archive and click on this month or last month in the sidebar on the left. Also check out the labels in the sidebar to see posts about one of my frequent topics (such as Shenandoah or Family or Civil War.